Winter READ 2018: Books Gone Hollywood! The Winter READ 2018: Books Gone Hollywood begins February through March! Does winter make you want to curl up with a book or binge watch movies? Let Heyworth Public Library be your source of great reads to take you on a winter adventure to find out if the books are really better than their on-screen versions. For adults and teens, we will hold the Fifth Annual “Blind Date with a Book” event during February. We have selected books that have become movies, some classic, comedies, and quirky. You decide which is better. Come in and choose a wrapped book as your “blind date”. Give it a read. Then fill out our “Rate Your Date” bookmark and return it with the book. We are not arranging marriages, and not a dime has to be spent! Just try a “blind date” – you never know which new favorite author or genre you might fall in love with. All “Rate Your Date” bookmarks returned will go in a drawing for (4 winners) four movie night popcorn bowls with all the trimmings for a screening of your favorite book turned movie! The last day to grab a Blind Date will be on February 28, but we will not draw a winner until March 22 to allow readers three weeks to get their “dates” read. Join us in March, and read for prizes all month long for all ages. We will celebrate books to movies and all things Dr. Seuss. Readers will receive a ticket for every book, audiobook, eBook, or magazine checked out in March for a drawing of prizes. The Winter READ ends March 31 and the drawings will be held on April 3. Family Story Time returns in February on Thursdays at 6:15 pm throughout the month, until March 15. Mark your calendars and bring the kids for a great time of stories, music, and crafts. Don’t forget to check out our Book Sale area. We are brimming with great reads, music, and audiobooks. All for a donation that you choose to help support the library in purchasing the extras, not in the budget. Are you looking for free eBooks and downloadable audiobooks? If your portable device or phone uses apps from the Google Play or iTunes stores, you can use our FREE library apps. Visit the library website at heyworthlibrary.com for tutorial help sheets with the various e-readers using Libby (OverDrive), Axis 360, or BookMyne. Alternatively, call to schedule a face-to-face tutorial (473-2313) on using the library’s apps. Jan. 19 After School Movies, 3:20 p.m. Every Friday the library is open. Bring a friend and your own snack! All drinks need to have a screw on cap – no juice pouches or cans please. Jan. 25 After School Book Club 3-5 Grade, 3:30 p.m. Every fourth Thursday of each month. HPLD After School Book Club 3-5 grade will meet in the Community Room after school at 3:30 pm to read, discuss, and do activities based on the selected book. We will be reading Peter and the Starcatchers by Dave Barry and Ridley Pearson. Stop by the library and pick up your copy to begin reading this fun adventure. Audiobooks are available too! Jan. 25 Heyworth Knitters, 6:30 p.m. – 7:30 p.m. on the 2nd and 4th Thursday of each month. We are thrilled to offer crafters a space to create and socialize! This group is very willing to teach anyone who would like to learn to knit or crochet. We have yarn, instructions for beginning projects, and needles to get you started on a new hobby. If you want to learn how to knit, you must sign up to attend, so the knitters can have all you need ready for the evening. If you are a knitter or a crafter, looking to socialize with others in our area, just show up as your schedule allows. Available to anyone 4th grade and up. In February plan to join us on 2.8/2.22. Feb. Blind Date with a Book all month! Feb. 1 Family Story Time RETURNS!, Groundhogs and Shadows, 6:15 pm – 7 pm, This program is geared for pre-school through first grade; however the whole family is welcome to join in on the fun. Come explore art, participate in crafts, and enjoy stories. Feb. 1 Adult Book Club, 6:30 p.m. Every first Thursday of the month. We will be discussing The Tea Girl of Hummingbird Lane by Lisa See. Stop in and get your copy today. Feb. 21 Little Bricks & Big Ideas, 3rd Wednesday of each Month at 3:30 pm. Lego building, afterschool snack, and games. Sign up at the library. K – 8th grade. Feb. 28 Senior Info. & Assistance, 10 a.m. – Noon. The trained staff of Community Care Systems, Inc. will be here to assist people over the age of 60 and the disabled with filing for local, state, and federal programs. Their next visit will be March 28. 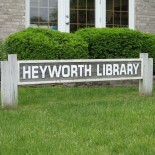 This entry was posted on January 17, 2018 by Heyworth Public Library District.